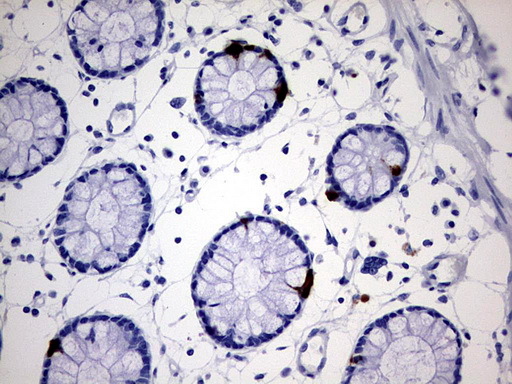 AVPI1 Antibody (N-term) (Cat. 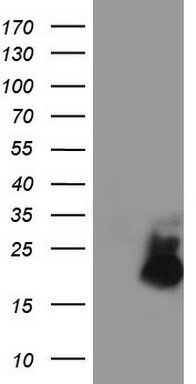 #AP50316PU-N) western blot analysis in MCF-7 cell line lysates (35µg/lane).This demonstrates the AVPI1 antibody detected the AVPI1 protein (arrow). 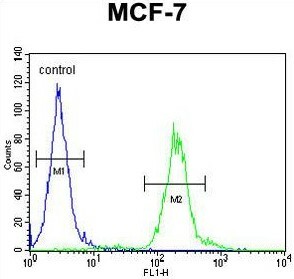 AVPI1 Antibody (N-term) (Cat. 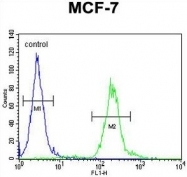 #AP50316PU-N) flow cytometric analysis of MCF-7 cells (right histogram) compared to a negative control cell (left histogram).FITC-conjugated goat-anti-rabbit secondary antibodies were used for the analysis. HEK293T cells were transfected with the pCMV6-ENTRY control (Left lane) or pCMV6-ENTRY AVPI1 (RC201721, Right lane) cDNA for 48 hrs and lysed. Equivalent amounts of cell lysates (5 ug per lane) were separated by SDS-PAGE and immunoblotted with anti-AVPI1.